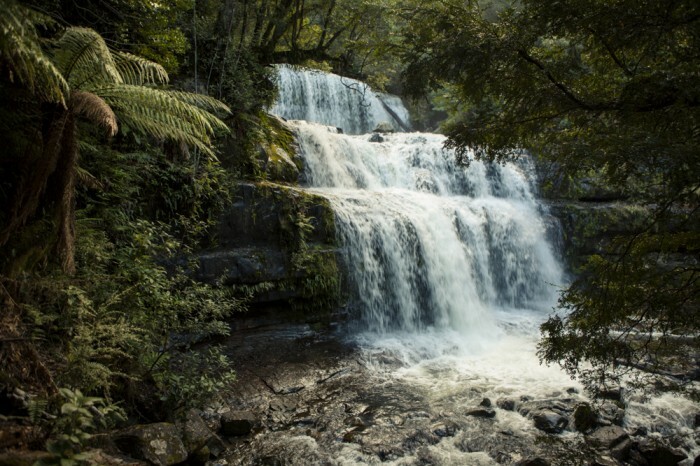 Regarded as one of the most picturesque waterfalls in Tasmania, Liffey Falls is a prized attraction that should definitely be on everyones list of places to visit. Located south-east of Deloraine this stunning sandstone tiered waterfalls finds its home nestled within beautiful myrtle and eucalypt forests. Skirting the Liffey River in its entirety, the 8km return walking track to the falls is well constructed and suitable for most walkers. For those limited by time, a much shorter 45 minute return trail from the top car park (accessed via Riversdale Road) provides easier access but neglects the lower sections of Liffey River. View Google Map Directions The following route provides access to the lower Liffey Falls car park.Leaving Launceston take the A3 exit onto National Highway 1. Take the route 1 exit towards Prospect/Devonport. Continue along National Highway 1 for 16km before taking the C511 exit towards Bracknell. Once in Bracknell turn right onto Louisa Street and continue onto Bracknell Road. After 8km turn onto Bogan Road and continue until you reach Gulf Road Picnic Area. 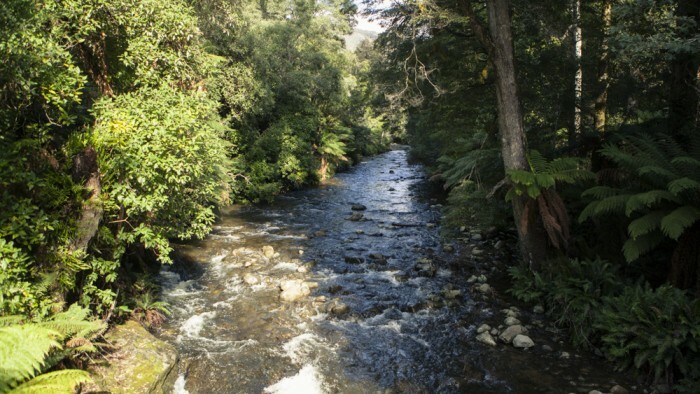 The Liffey Falls track begins from the southern side of the grounds. The walk described here is from the lower car park. Beginning from the southern end of the Gulf Road Picnic Area, the trail follows the eastern bank of the Liffey River through ancient myrtle forests. After 1km the river is crossed via a bridge and the trail continues on the western bank. 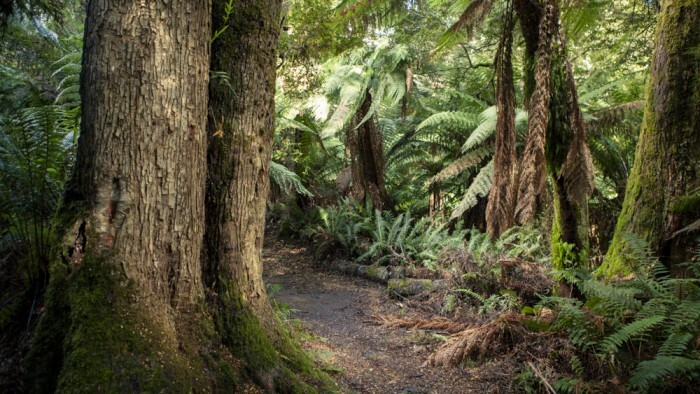 For the next 1.5km the trail darts between lush tree ferns and the river before crossing another bridge. From here the trail begins to gently ascends through rainforest littered with ferns. Note that sections of the track may be muddy during wetter months. 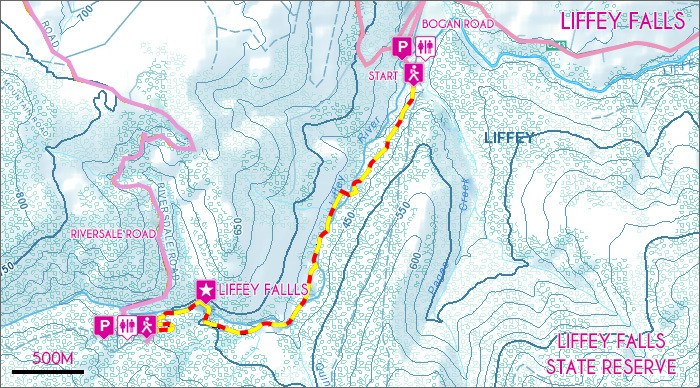 After about 1km, the Liffey Falls are reached via a short side track. Broken into two main tiers, the Falls are a magnificent sight with water sourced from the Great Western Tiers surging over the sandstone edge. Continuing further on the main track, the Spout cascade is seen next from a well-constructed viewing platform. For those wishing to continue further, the top picnic area can be reached via a winding 1km track and makes a suitable break spot. Toilet and barbecue facilities can be found here. Return to the trailhead via the same route. The banks of the Liffey River can be quite slippery. Take care when approaching the water.